The Billion Roses store needed a new florist sales counter for their store in Alexandria. They needed something simple, elegant and practical. Adam decided on the Amanda sales counter for those three reasons. Adam was after a white gloss sales counter that looked very neat and tidy. The Amanda achieves this through a seamless design, creating a very smooth finish using hard wearing white gloss laminate. Behind the counter are some drawers and shelving for all the storage you need around a sales counter. Being a normal work bench height, this counter creates a welcoming atmosphere for customers to come up and pay for their orders. The Amanda is built using very hard wearing materials. The core board is high moisture resistant (HMR) board, 16mm thick, for sturdy protection. The covering laminate is a super hard wearing gloss, perfect for a work surface. All of our counters and cabinets are Australian made by us on the Central Coast. To learn more about the Amanda sales counter, please click here. The Billion Roses is a Sydney based florist company, which ships interstate and internationally. They sell some amazing arrangements, including their 1 year roses. These roses are specially treated by The Billion Roses to last 1 year without needing water! To learn more about The Billion Roses, please click here to go to their web page. 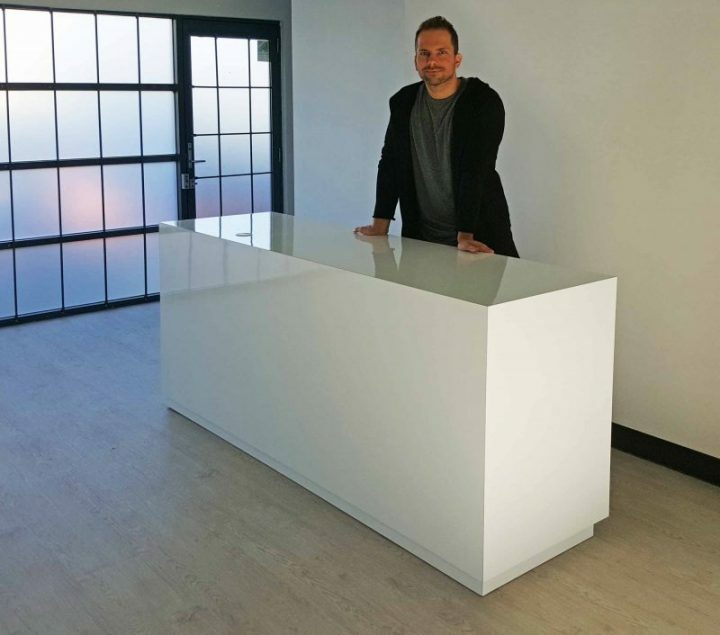 Astute Financial contacted us after seeing our Curvarto Reception Desk online. They loved it so much they ordered it and paid on the spot. 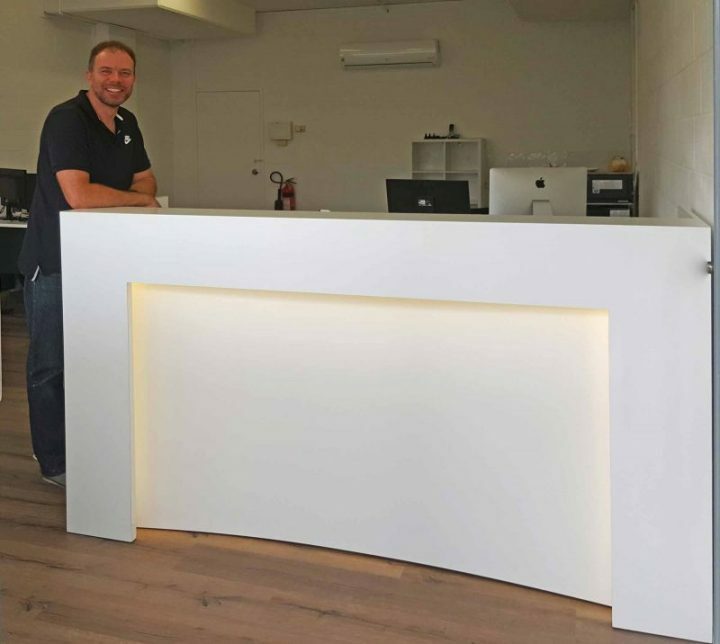 Sam from Astute was looking for an affordable yet stylish reception desk for their new office opening in Nelson’s Bay. They needed something professional, practical, and a bit decorative for a stand out reception area. Jason in the new Nelson’s Bay office was thrilled with the result. They were so thrilled in fact, they have ordered another one for their Dee Why office. The Curvarto is a simple, streamline desk which features a curved panel at the front. This creates an interesting surface for sign and lighting design, as the angles reflect the light. Using hard wearing white gloss laminate reflects the light even brighter to really make this a stand out desk. It is made out of HMR board, making it as hard wearing as it is attractive. Astute is a company offering financial advise, wealth building advise and brokering services. They have many partners in their endeavours, and are expanding as their name continues to grow. To learn more about Astute, click here to go to their website.